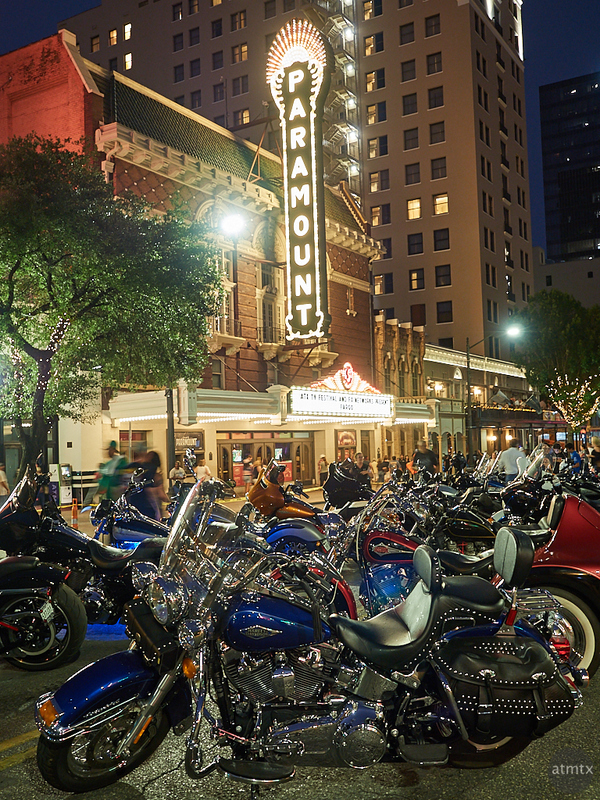 As a complement to yesterday’s post, here’s the Paramount Theater located on Congress Avenue. Shot just after the ROT Rally parade, when the participants are allowed to park on the signature downtown North-South street, for a few hours. As further evidence of how framing and timing matters, I took this photo around the same time, from a different angle, which gives an entirely different impression. While today’s image, with its jumble of bikes, gives a lively impression, the other photo is sedate and even zen-like in its relative calmness. I really like the recent restoration of the bold Paramount Blade, attached to the front of the building. It was added a couple of years ago, modeled after the original. It gives an old world, timeless feel which harkens back to the golden age of theaters.